Mountain bikes allow you to explore, whether that’s on your home trails or a little further afield. Not only is exploring good for your soul you can also experience some incredible places and soak up some pretty awe inspiring scenery and cultural experiences along the way. Big adventures can be found all over Europe, but if you’re looking for something a little less well known then heading to South America should definitely be on your bucket list. 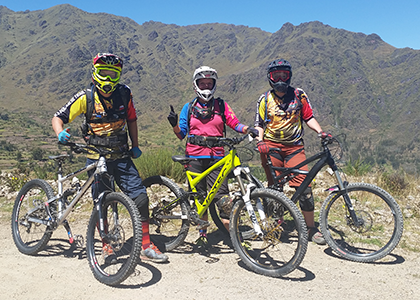 The mountain bike scene in Peru has been gathering momentum over the past few years, with a handful of companies offering guided trips around the Inca trails and impressive mountain valleys. 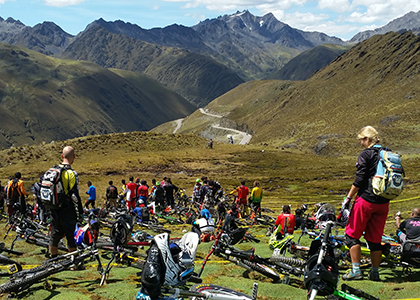 For those riders that like to up the ante and the adrenaline levels, there’s also an annual high mountain race called the Inca Avalanche that is a once in a lifetime experience for any keen mountain biker. A whole day and a half of travelling to get somewhere so special is definitely worth it, even with a huge and heavy bike bag in tow and travelling solo adds yet another dimension. Jumping into a taxi from Cusco airport to get to Ollantaytambo, my base for the week, was a mini adventure in itself; snaking around dark mountain roads with the bike bag slung across the back seat, avoiding large trucks and coaches on the narrow corners, all totally unlit save for headlights. At least I could be thankful that the driver knew the roads like the back of his hand. Arriving somewhere new and totally unfamiliar at night allows you to appreciate the full impact of where you are the next morning. The sight of Inca ruins across the valley, steep mountain sides everywhere you look, palm trees and two alpacas in the garden was a real treat. Good morning Peru! Taking full advantage of the spacious front lawn at the lodge It wasn’t long before I had my bike built, and after a hearty breakfast our guide arrived. I say ‘our’ at this point, as it turned out that a German couple who I met on the lawn also building their bikes, had booked onto the same trip as me, including the race. Before long we were all packed up with bikes on the roof rack of the minivan, ready to get our first day of riding underway. The week ahead was to involve riding in a different valley every day, all within a few hours of Machu Picchu, culminating with the Inca Avalanche race at the end. Day one saw us heading straight for the racecourse at a place called Abra Malaga (~ 4200m above sea level). The drive to the top seemed to go on forever, hairpin after hairpin as we snaked our way to the top of the pass, stopping once to take a look back down the valley to appreciate how high we had come. After unloading at the head of the trail near a tiny farmstead, we stared down the route we were going to take, absorbing the incredible scenery and the three condors that suddenly flew into view above us. Our guide explained that these giant birds are listed as endangered and that we should feel incredibly lucky to have seen three at once – a sign that we all took as a good omen for the week ahead. We took our time on the trail, stopping to check out small jumps and thinking about how this relatively narrow Inca trail would feel with hundreds of people funnelled into it, all trying to overtake each other. It was a leisurely first descent, with lots of stops to recce lines. The terrain on the 14.5km route changed from marshy bog grass at the trail head to hard packed earth, a shallow river crossing lower down and sections where you have to join and cross over the road. Drainage ditches suddenly appeared as the road sections came into view and with flimsy looking planks or worn pieces of paving slabs covering them, you had to get your angle onto them completely dialled or else you (and your bike) would be in trouble. Around almost every corner on every trail, there are Inca terraces and ruins and one particularly large ruin set back from the corner of the road, made a good place to stop for a drink, to rest and take photos. It was hot even though we were well above 3500m at this point. During the week we rode along single track and footpaths that only the locals used, passing goats, donkeys and one memorable shepherdess in brightly coloured local dress with a small child tied around her back in a blanket. We also rode past a trout farm one day, which was quite unexpected this high up. Every town we drove through to get to new trails was full of brightly coloured local women with different hats and skirts, which according to our guide, changed depending on which part of the region they were from – long skirts for drier areas and short, heavily pleated skirts for more muddy places. The terrain in all of the valleys changed quite considerably, from dry mud paths and brownness to almost tropical looking greenery along river beds. V-shaped valleys opened out onto lush green foliage with simply stunning views. Inca ruins, farmsteads and Inca terraces literally everywhere you look. The guide took us on trails fit for our ability – we’d explained at the beginning of the week what we’re used to riding in our respective home countries and the trails he took us on matched up appropriately. 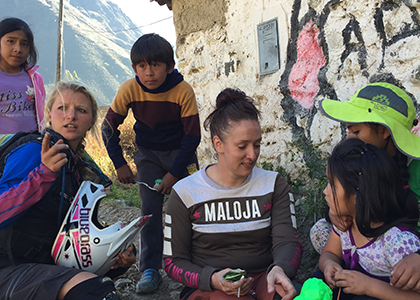 We rode Inca steps, rocky trails, through a salt farm, on dirt tracks and even bushwhacked through a cornfield at one point. He knew after all, that we were aiming to ride in the Inca Avalanche later that week and so chose good trails to warm us up on, all of them at around 3000-4460metres altitude. Each of the trails was different in some way with lengths of anywhere between 8-22km. He also gave us the chance to get a few more practise laps on the actual race route ahead of schedule too, which was very much welcomed. Riding (or even walking around) at altitude can make you feel a little light headed and it affects people differently. 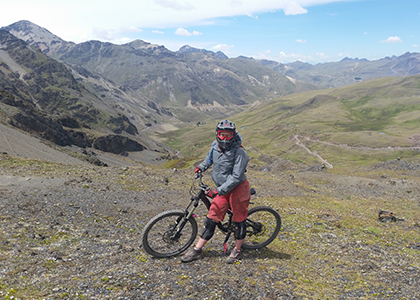 On one trail that started at the top of a 4,600 metre pass called Abra de Lares (where you’ll also find a huge scree slope you can ride down) a wave of nausea came over me, but after chewing on a few locally grown coca leaves and taking time out in the minibus, the feeling passed. Pedalling up here is tough and even pumping up tyres is hard work, in fact the hardest I’ve ever found it. It was all good practice though and before long qualifying day for the race had arrived. 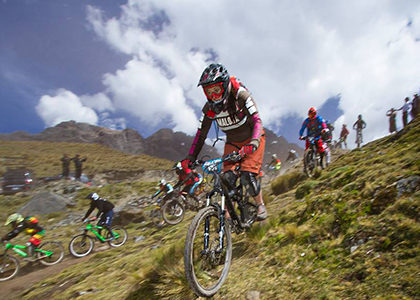 The Inca Avalanche is an ‘Avalanche format’ race, where hundreds of riders all set off either at once or in large groups, on the same course. 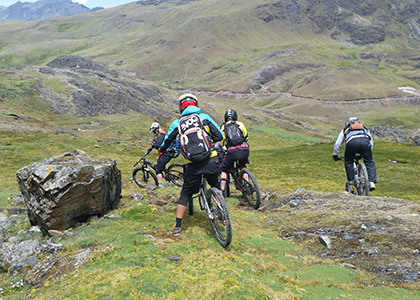 Having ridden the Megavalanche in Alpe d’Huez back in 2011 I thought I knew roughly what to expect, although the difference with this one – the big difference, was the altitude. The start line was around 4300 metres, in the shadow of a glaciated mountain and the competitors were 80-90% locals who were used to living, riding and racing this high up. To give this some perspective, Mont Blanc, the highest mountain in Europe, tops out at 4810 metres. You don’t need oxygene up there but the air is much, much thinner than at sea level and everything takes a lot more effort to achieve. Qualifying took place over the course of one day, with some people opting to do a second run for a better time, or because they’d punctured or crashed out on their first attempt. Having already covered around 100 kilometres of riding in the week leading up to the race, once was enough for me , especially as I didn’t want to tire myself out for the main event the following day. Having watched numerous races first hand in Europe you become accustomed to the rules, regulations and tight organisation, especially for things like World Cup races, however in Peru they tend take a bit more of a laid back approach. For example the route markers on linking road sections were slightly faded arrows on the tarmac which sent a few people off the wrong way on qualifying day and the marshals (local police officers) huddled together in small groups instead of shepherding us in the right direction and there were no whistles to signal that people had passed them safely. But then no-one really seemed to mind too much, after all, you don’t travel that far across the world to have an experience you could have had at home. The riders on the start grid were on mostly hardtail bikes; full suspension bikes are a cost that most people aside from sponsored riders can’t afford in Peru or insurance for that matter, as our guide told us. There were a few British and American expats in the race, quite a few children under 16, one girl in hot pants riding a fatbike (!) 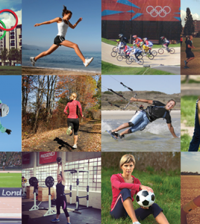 and in all out of the 212 people taking part, 12 of us were women. The start grid was exhuberant, a mixture of anticipation, adrenaline and good camaraderie that you’ll find from mountain bikers the world over. We set off, bar to bar, jostling for position over the boggy ground, thankful that there wasn’t any snow as there had been in the race the year before. There were crashes straight from the off and a great many punctures too. A lot of people weren’t carrying spares so it was game over for them. Thankfully my ride was all but clean, although quite a bit slower (a good 20 minutes) than the fastest men and around 10-15 minutes slower than the fastest women. One crash before the end on a particularly long, steep dirt chute (right in front of a photographer) was quickly forgotten as the crowds came into view just before the finish line, cheering us all on. I even managed a sprint on very weary legs and lungs; riding as fast as you can, non-stop for 14.5 kilometres is hard work! A party and awards ceremony on the main square in Ollantaytambo later that night was a fitting end to an incredible week of riding, in some of the most beautiful mountains I’ve seen (and I live in Chamonix). Coming 6th place out of the women wasn’t enough to make a podium but then I hadn’t taken part thinking that I would win, or even come close. 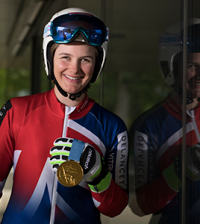 The experience was what it was all about for me, as well as representing women in an otherwise male dominated sport. The mountain biking that week was in some places challenging and nerve wracking, but also exhilarating, awe-inspiring, beautiful and on trails that some days I thought would never end (or at least didn’t want to end). 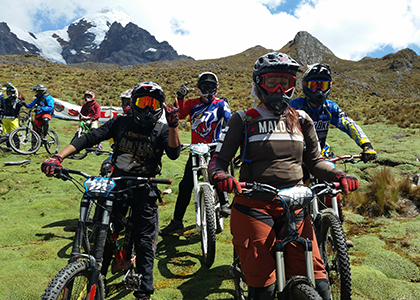 The beauty of mountain biking in Peru is that you don’t even have to be an accomplished rider to enjoy it. Plenty of companies offer one or more days experience as part of a hiking or adventure package and you can choose to do a more leisurely ride around some of the easier trails, head all the way down to the jungle or join the race as I did. 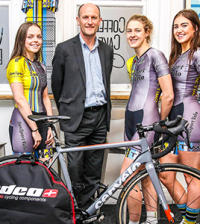 You can take your own bike, or use the equipment provided by these companies, which is especially useful for those on longer trips not wanting to take too much kit with them. For any serious mountain bikers though, I can’t recommend enough the benefits of taking your own bike with you. It only costs a little bit more for excess baggage which you can cram full with extra clothing and spares, and the taxis and coaches are really cheap, so getting to your accommodation with a bike bag in tow is really not a problem. 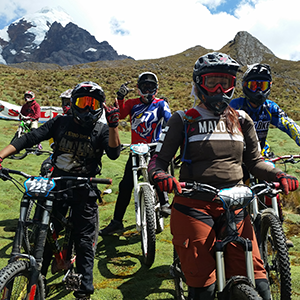 Mountain biking in Peru is something not to be missed. 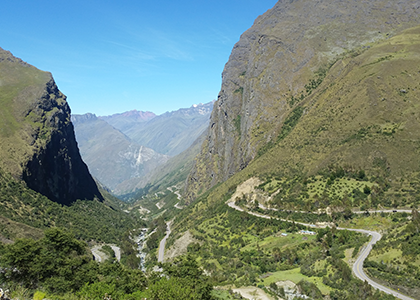 There are so many epic long trails to explore, surrounded by stunning scenery, mountains and Inca ruins at every turn. If you can handle the altitude it’s well worth the journey to get there. The race is 14.5km long and takes you from around 4300 metres down to 2800 metres. This years race takes place on the 29th & 30th April 2017. Tour company: I booked with KB Peru kbperu.comand stayed with them for the week at the Tunupa Lodgetunupa-lodge.com in Ollantaytambo, 500m up the road from the train station for Machu Picchu. I had a twin room to myself overlooking the gardens with a private bathroom. Trails we rode during the week were anywhere from 6-18 km long each, two per day. Cost for the week was €1300 (or €1000 if you bring your own bike which I’d strongly recommend). The price included pick up from the airport in Cusco, accommodation, daily minibus shuttles, MTB guide, breakfast, lunches, race jersey & race entry.